Alastair Lynch will be remembered as one of the all-time greats of the Australia Football League. Following his senior debut for Tasmanian club Wynyard, in 1986 Lynch was drafted at number 50 in the first ever AFL National Draft. Lynch would go on to play 120 games between 1988 and 1993 with Fitzroy and 186 games with the Brisbane Bears/Lions. In a career spanning 17 years and 306 games at the elite level he became captain of a team that would win a historic three premierships in succession between 2001 and 2003. Many would argue that this team was the greatest of all-time. In the mid-90s, Lynch defied the career-threatening illness chronic fatigue syndrome. His highly publicized battle would inspire thousands of sufferers around the country and draw wider attention to the illness. Lynch returned to football in 1995, missing only one game and probably playing his best football despite his age. Born in Burnie and raised in Wynyard in North-West Tasmania, Lynch was a powerful marking full forward and one time full-back. 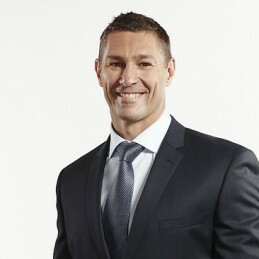 He was awarded with All-Australian selection in 1993 and was made a co-captain of the Lions from 1997 to 2000. Lynch stood down as captain from this star-studded team to allow Michael Voss to take full control of the team. In 2004, his final season, he became the 23rd player to kick 600 goals and the 43rd player to reach 300 games. He finished his career equal fifth on all time finals goals kicked. Lynch was named in the Fitzroy and Tasmanian team of the century and was further honored when Tasmania’s highest football individual award was renamed the Alastair Lynch Medal. Lynch has remained living in Brisbane, balancing work in the media with business interests. His 2005 bestselling autobiography, titled ‘Taking Nothing For Granted’, covered Lynch’s time in football and battle with chronic fatigue syndrome. Now an in-demand corporate motivational speaker, Lynch continues to write a newspaper column in Brisbane and Hobart. He is part of Triple M’s radio and Fox Footy’s broadcast teams and a regular on popular panel show After the Bounce with Jason Dunstall and Danny Frawley.